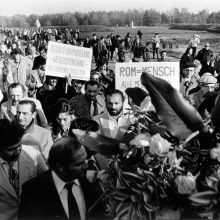 In October 1979, what was then known as the Association of German Sinti, supported by the Society for Threatened Peoples, organised the first large-scale international remembrance ceremony for Sinti and Roma victims at the former Bergen-Belsen concentration camp. 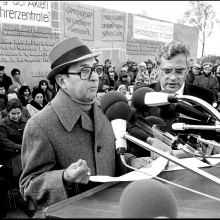 It was attended by around 2,000 participants, including 500 Sinti and Roma from twelve European countries. 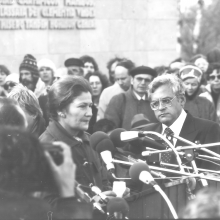 The first president of the European Parliament, Simone Veil, gave a speech, alongside representatives of the churches, political parties and other victim groups of Nazi persecution. 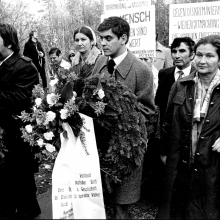 As a Jewish survivor of the concentration camps at Auschwitz and Bergen-Belsen, Veil underscored her solidarity with the Sinti and Roma, who had themselves been persecuted.